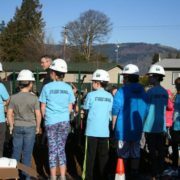 The May Street School Ground Breaking on February 12, 2018 was an exciting day for the Hood River School District, parents, staff and students. All that attended had a wonderful time sharing stories of the history of the existing May Street School and sharing in the anticipation and excitement of moving into their new 75,700 square foot school to be constructed by Kirby Nagelhout Construction Company. Members of May Street School Student Council used gold colored shovels to move the ceremonial first scoops of dirt as the project officially got underway. The architect for the new replacement school is Opsis Architecture and the Owners Representative is The Wenaha Group. The school is scheduled to be completed in the fall of 2019.